Below is a listing of nearby events which may be of interest to local organists. Please contact info@greenvilleago.org to contribute to the list. Friday, April 12 2019 7pm: Solemn Stations of the Cross featuring the Stabat Mater by Pergolesi. Prince of Peace Catholic Church; 1209 Brushy Creek Road; Taylors. Saturday-Sunday April 20-21 2019: Mozart Missa Brevis, K 194 at the Saturday evening and Sunday morning Easter Masses. Prince of Peace Catholic Church; 1209 Brushy Creek Road; Taylors. 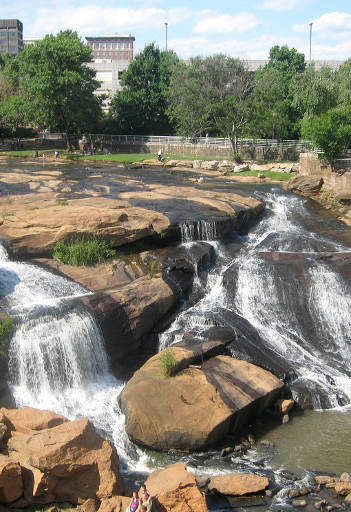 Every Thursday 8-9pm: On SC Public Radio, David Kiser hosts On the Keys. Every Sunday 2pm: On WEPR 90.1 FM, Michael Barone hosts Pipedreams. Monday, April 1 2019: La Maïtrise de Reims Childrens Choir and Chicora Voices, Prince of Peace Catholic Church; 1209 Brushy Creek Road; Taylors. $10 advance, $15 at the door. Saturday, March 30, 2019: Young Organists Competition, Brainerd United Methodist Church, Chattanooga, TN. Deadline for entry is December 15. Saturday, March 16, 2019: Pedals, Pipes, and Pizza. For teenage pianists (ages 13-18), 9:30-3 at First Presbyterian Church and the Episcopal Church of the Advent in Spartanburg. The cost to attend is $10. Contact Brennan Szafron. Saturday-Sunday, February 16-17, 2019: Dan Miller workshop and dedicatory Rodgers recital. Saturday workshop 9am-noon; Sunday concert 4pm. Surfside UMC, Surfside Beach, SC. Tuesday, Feburary 12, 2019, 8pm: Chenault Duo recital, Hartness Organ Series, Daniel Memorial Chapel, Furman University. Sunday, February 2, 2019, 7:30pm: St. Olaf Choir Winter Tour concert at First Presbyterian Church, Greenville. Thursday-Friday, January 24-25, 2019: Furman University Church Music Conference featuring Dr. Bruce Neswick, Canon for Cathedral Music at Trinity Cathedral (Episcopal) in Portland, Oregon. To participate in singing Evensong, register by November 15 ($75). Friday-Saturday, January 18-19, 2019: Central North Carolina Chapter SmOrgansBord 2019, featuring workshops and an opening concert by Dr. Carol Williams. Friday, December 14, 2018, 7pm: Bach Christmas Oratorio by the SC Bach Choir and Soloists and NC Baroque Orchestra at Rosalind Sallenger Richardson Center for the Arts, Wofford College; 130 Memorial Drive; Spartanburg, SC 29303. 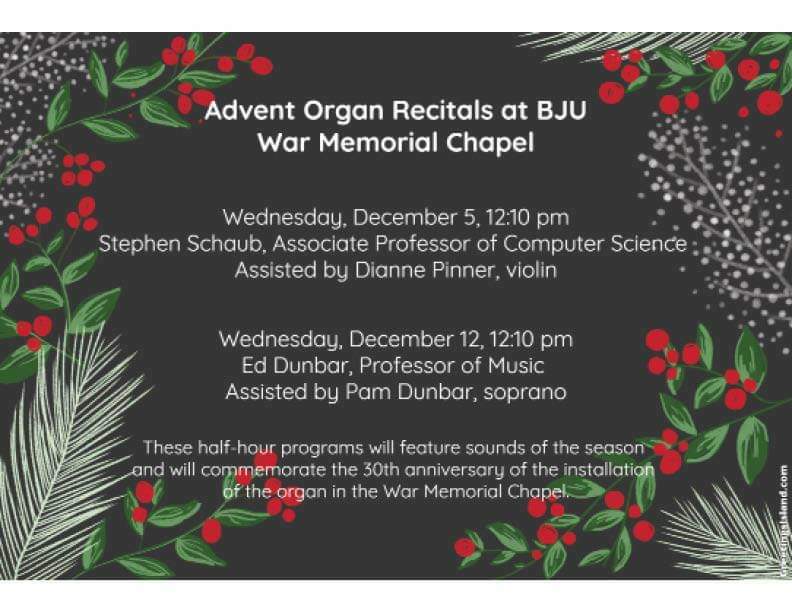 Wednesday, December 12, 2018, 12:10pm: Advent Organ Recital, War Memorial Chapel; Bob Jones University. Thursday, December 13, 2018, 7pm: Bach Christmas Oratorio by the SC Bach Choir and Soloists and NC Baroque Orchestra at First Baptist Church; 847 Cleveland St; Greenville, SC 29601. Sunday, December 9, 2018, 5pm: Lessons and Carols, Greenville ARP Church; 741 Cleveland St; Greenville, SC 29601. Friday, December 7, 2018, 7:30pm: Governor's School choral concert. Westminster Presbyterian Church, 2310 Augusta St, Greenville. Music for the season and choral gems. Free. Program. Wednesday, December 5, 2018, 12:10pm: Advent Organ Recital, War Memorial Chapel; Bob Jones University. 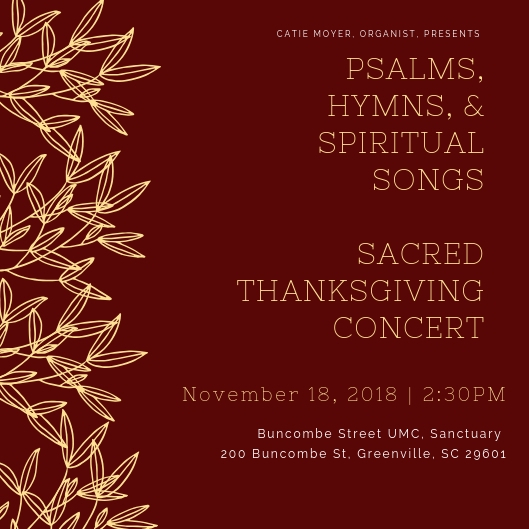 Sunday, November 18, 2018, 2:30pm: Catie Moyer, organist, presents Psalms, Hymns, & Spiritual Songs, a Sacred Thanksgiving Concert, at Buncombe Street UMC; 200 Buncombe Street; Greenville SC 29601. Sunday, October 28, 2018, 12pm: Mass of Christ the King. Prince of Peace Catholic Church, 1209 Brushy Creek Road, Taylors: Extraordinary Form Latin Mass celebrating the feast of Christ the King featuring Missa "O quam gloriosum" by Tomás Luis de Victoria. Sunday, October 28, 2018, 7:30pm: Spooktacular Organ Concert at Christ Church; 10 N Church Street, Greenville, SC 29601. Brennan Szafron. Free. Sunday, October 28, 2018: Reformation Sunday at Trinity Lutheran, featuring the Capital City Brass quintet. 9am and 11:15am. Sunday, October 21, 2018, 4pm: Fireworks for Organ and Orchestra at St. James Episcopal Church; 301 Piney Mountain Road; Greenville, SC 29609. Spartanburg organist, Brennan Szafron. Gary Malvern will offer a pre-concert talk 30 minutes prior. Saturday, October 20, 2018, 7pm: Fireworks for Organ and Orchestra at Episcopal Church of the Advent; 141 Advent Street; Spartanburg, SC 29302. Spartanburg organist, Brennan Szafron. Gary Malvern will offer a pre-concert talk 30 minutes prior. Saturday-Sunday, October 20-21, 2018: Organ Invitational, Pacific Lutheran University, Tacoma, WA, celebrating the 20th anniversary of the Fritts organ. Thursday, October 18, 2018 7pm: Philip Manwell in recital at First Presbyterian Church, Spartanburg. The organ is an Aeolian-Skinner. "OTHER TIMES... OTHER PLACES" features music from Sweelinck, Handel, Walther, Bach, and others.